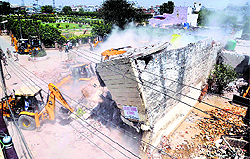 After demolishing illegal structures in Zone D yesterday, the Municipal Corporation teams today razed many illegal structures in Zone C.
A snatching and robbery were reported in the city today. According to the police, both the incidents occurred on May 6. It has been more than two months since Ranjit Singh (59), principal of Government Senior Secondary School, Latala village, allegedly committed suicide by jumping into Sirhind Canal but the Khanna police have failed to act against the “MLA of Dakha”. The Primary Health Centre (PHC) at Rauni, Ludhiana district, has been without general and Ayurveda physicians for the past four months. The entire village is dependent on three nurses for their health problems. One permanent post of nurse is lying vacant. 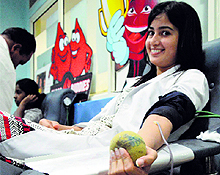 With fewer persons coming forward for blood donation in the city, shortage of fresh blood is one major problem faced by patients of thalassaemia. Children, who undergo transfusion every two or three weeks, need fresh, not stored, blood. Thalassaemia is a hereditary disease of the blood caused by genetic defects in a patient’s body, which results in the production of an abnormal form of haemoglobin, thus causing anaemia. On the directions of the Civil Surgeon, Dr Subhash Batta, a team of the Health Department collected milk samples from vendors in different part of the city early this morning. Deputy Commissioner Rajat Aggarwal has instructed private school managements to abide by rules of the Education Department and avoid burdening parents by increasing school fee. Principal Secretary, School Education, ordered to shift the classes of Government High School, Chawani Mohalla, to Government Senior Secondary School, Kundanpuri, on Wednesday. The scholarships for SC students, which the students were expecting to receive at the beginning of the session, finally arrived after the culmination of the academic session. The Central Board of Secondary Education (CBSE) has instructed schools to create awareness on health risks associated with tobacco consumption. 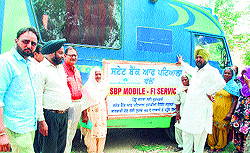 With its purpose to achieve the target of financial inclusion, the Doraha branch of State Bank of Patiala has launched mobile ATM vans in two villages and aims to spread it to other villages as well, in the coming months. Gurmeet Singh, a resident of Preet Nagar, who was refused mutation of a bank-attached property, has accused revenue officials of transferring the title of one such property without registering land deed. HS Phoolka, Aam Aadmi Party (AAP) candidate from the Ludhiana constituency, today urged the party volunteers to remove posters from their locality. Seeing Punjabi cinema doing well, property dealers and other investors jumped into the bandwagon to produce Punjabi movies, but because of the lack of experience of the film industry and its working and dynamics, many movies are struggling to find shows in multiplexes and cinema houses. In the absence of adequate parking space, chaos reigns supreme on various roads of the town. There seems to be no end to the woes of commuters. Traffic jams are a routing affair here. Most of the areas have been developed in an unplanned manner. A majority of roads are narrow. Members of Baba Amarnath Langar Committee, Ludhiana, paid their obeisance at Baba Kedarnath and Badrinath temple and took permission from the Almighty to hold a bhandara in the city from June 25 to 27 for the pilgrims. It was a mellow May morning full of fun, frolic and enjoyment as mothers gathered at ABC Montessori School, Ludhiana, BRS Nagar, to celebrate Mother’s Day with smiles and laughter. A delegation of Knitwear Club comprising its president Darshan Dawar, senior vice-president Jaswant Lal Takkar and general secretary Narinder Miglani, called on the Deputy Commissioner Ludhiana soliciting his indulgence for conducting smooth and fair elections of Knitwear Club so that true spirit of democracy should prevail in the functioning of the Club. The police have booked five persons for allegedly duping an NRI of approximately Rs two crore. Two of the accused have been arrested and identified as Ranjit Singh, a resident of village Doomewal, and Rajinder Singh of Amloh. Controversy shrouding Swami Ramdev after his alleged remarks against dalits and congress vice-president Rahul Gandhi's visit to houses of dalits for ‘honeymoon’ and ‘picnic’ has not died yet.